Shopify is one of the best e-commerce platforms – especially when it comes to its wide range of features and ease of use. Whether you are running a services business or selling e-books, you can monetize your project efficiently using this platform. It has a lot of great functionality but one the best things about it is the great collection of themes available. 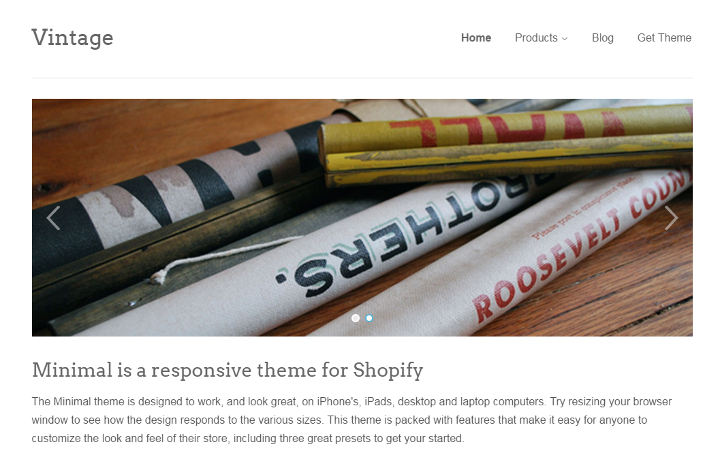 Shopify has some of the best themes around in the e-commerce space that can be a great fit for your online store. Not only is your e-commerce system taken care of completely but you also get an amazing looking website that charms your audiences and clients. In this post, we will run over some of the best Shopify themes that you can currently get to make your website shine in the crowd. 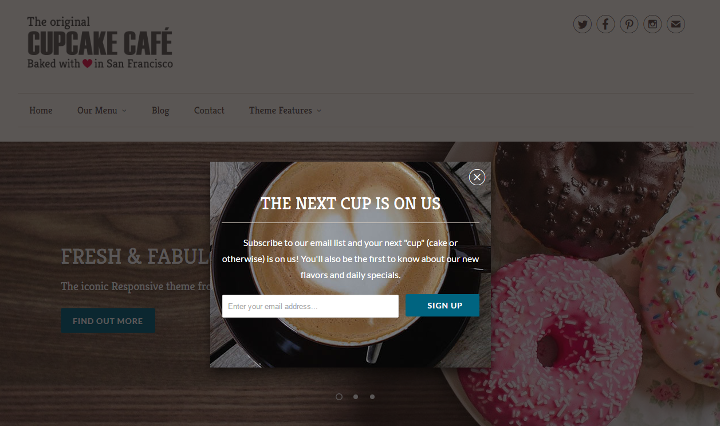 If you own a restaurant or eatery, you can create a lovely website for it using Foodly. Its integration with Shopify means that the features don’t just end at the great looks but you can also sell your products directly from your website. It is also a great theme for agriculture and farming websites as well as the organic and natural foods sites. Foodly has been awarded the number one Food-Related Shopify Theme award which is affirmed by the Envato staff. The theme comes with a visual constructor for a complete customized layout of your web pages. The layouts which are really easy to create thanks to the drag and drop technology that comes with the product. This is a true pro-user theme from scratch when it comes to development and that really shows in the design quality Foodly offers. Recipe articles and nutrition value selection. Notification button with discount and promotion messages. Comeback is a great Shopify theme with drag and drops page builders that help you modify the layout of your site to any structure that you’d like – without having to code at all. Designed and developed by tvlgiao and includes over 8 different stylish designs that are ready to use from the get-go. Comeback is responsive and has quick load times as well as being W3C, HTML5, and CSS3 compatible. The theme also supports internationalizing which means that webmasters can use the Shopify Language Editor for translating the content on their storefront to the language they’d like. You can also modify the color of your content as well as header, footer, and background in addition to other page elements. Offers support for multiple currencies. Integration with the huge Google Web Fonts library. Shows a popup message when add to cart action is performed. Supports multiple languages in front-end as well as back-end. Support for visually appealing slideshow images along with effects. A fantastic choice for your online store, YourStore is a full on, complete e-commerce solution. The theme ships with multiple layouts that you can choose from as well as 7 headers and 6 footers that you can mix and match in different combinations to either blend in with the latest website trend or even start your own unique one. There are a number of premium plugins and extensions that you get for free by simply purchasing the theme which adds even more value to the product. Your customers are a vital component of your online store and YourStore has not neglected them. All users – even non-registered ones – get access to a wishlist. Not to mention there are 2 variations of shopping carts that you can add to your website. Another great feature is the ability to add unlimited tabs for any product and you can have an edge over your competition by making sure all your product details are available to your customers in an orderly fashion. Responsive on any screen size and retina ready. Options for setting up a blog. Catalog mode for increasing responsiveness levels. Minimum load times and maximum efficiency is what Minimal is all about. This entry on our list offers a minimalist look. If you’d like to get straight to the point without caring much for fancy animations and layouts then this one of a kind theme might be right up your alley. That is not to say that Minimal doesn’t come with its own set of customization options. You can tinker around with additional layout options, change navigation styles and typography among many other design-related configurations. There are 3 additional layout styles that the theme ships with which are Vintage, Fashion, and Music. All of them look great and you can also see other stores who are using this theme on Minimal’s theme page as well as a live preview to get a close-up experience of how the theme looks in action. Responsive and retina ready, looks great on any screen size. E-commerce support in a minimalist design with layout customizations available. Option to change navigation styles. If you are running a business that has you managing an inventory then you can pick up speed with the Solo theme. While it may not be for giant corporations, it will do perfectly fine for small to medium sized inventories. Furniture stores, equipment, hardware vendors, and other inventory-based websites can incorporate Solo for a free e-commerce solution that is sure to keep your mind at ease due to the solid Shopify framework. Solo has a great display for showcasing the items you have on offer and it is incredibly easy to navigate through. A solid core and clean coding practices ensure that your site gets lightning quick load times. Includes a homepage that can be rearranged. Retina ready and highly responsive design. Showcase option for featured products. SEO friendly and dedicated customer support. Do you own a clothing or apparel store? Perhaps you work in relation to the fashion industry? If you’re nodding your head in agreement then you should definitely check out Brooklyn. This is a theme for websites that is specifically crafted to meet your every need. 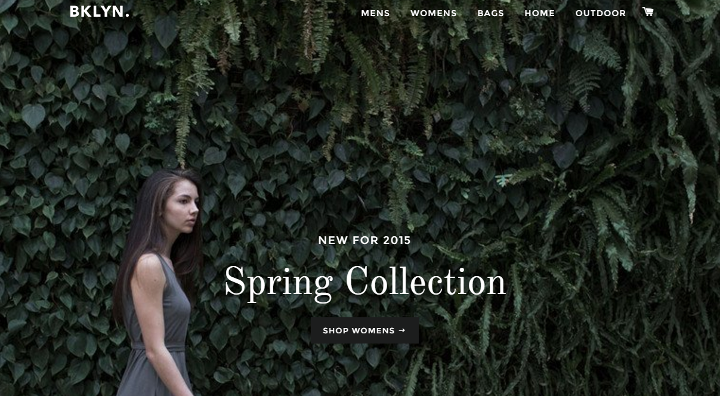 After all, what would a fashion or apparel store website be if it didn’t make a statement? Brooklyn has that covered with its modern, clean look that brings all the focus on to your products. The theme has extensive documentation that covers everything from uploading your preferred favicon to setting up your website newsletter for your audience. This makes it very easy to get started with for all kinds of users regardless of their technical expertise. Brooklyn also features two great looking and reliable cart systems. You can opt for the drawer cart which is an AJAX type cart or go with the page type. Newsletter support can be worked with MailChimp integration but can also be availed without it. Custom logo and header to fit your brand. 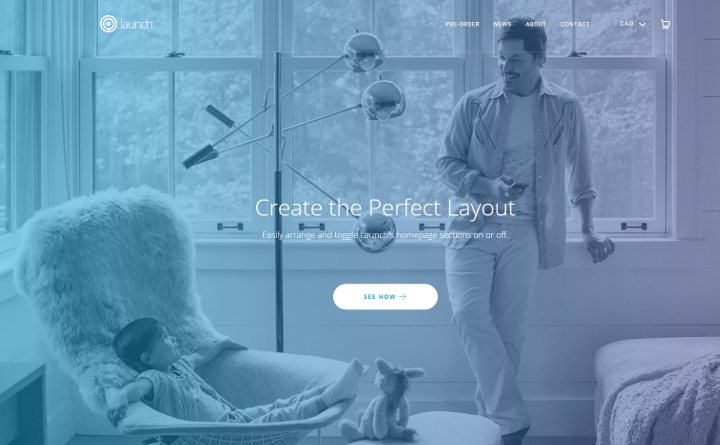 Edge to edge homepage hero, great product pages, and dynamic product grid. Retina ready and responsive design. E-commerce ready with Shopify integration. A theme that fits perfectly on any screen size and device, Responsive theme is robust, flexible, and comes packed with lots of great features. The theme can be quite a nice fit for any business type as it can add prominence to a variety of products. Made and supported by Out of the Sandbox, Responsive is built for optimized performance and can captivate your audience with the rich customizations that make your brand stand out. There are 4 different layout styles that ship with the theme and all of them rock modern looks that deliver value whether you sell books or bikes. Out of the Sandbox have also provided extensive documentation for their theme for maximum convenience but if you still run into some trouble then they have their support staff ready for your rescue. A product of Style Hatch Inc., District is a beautifully designed theme that leverages the Shopify platform to provide users with a solid and reliable solution for e-commerce. It can be customized with ease to fit your brand and is highly responsive to make sure that on-the-go audiences can fully experience all of the content. The theme also supports email marketing so that your visitors do not miss out on any of the great products or featured promotions. District also ships with Instagram integration because a picture speaks a thousand words and you don’t want to miss out on that. The theme comes with 3 different layout styles right out of the box which makes it incredibly easy to get started with District. Solid coding and SEO friendly. Retina is a flexible theme that offers a lot of value for money. 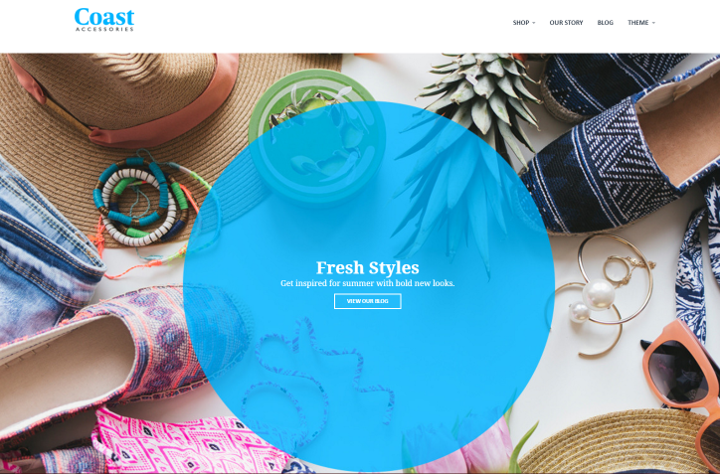 Tried and tested by many before, this theme has won the Shopify Design Award so you know that you are getting the best right out of the box. The theme ships with four different layout options – Amsterdam, Austin, Melbourne, and Montreal. All 4 are professionally crafted and are some of the most visually captivating products for online stores in the market for a truly unique theme. Retina offers seamless integration with Shopify to provide the optimum e-commerce experience for both you and your clients and combined with the ability to customize pretty much everything, as well as dedicated customer support to help you out should you find yourself facing some issue, you’ve got yourself one premium package. 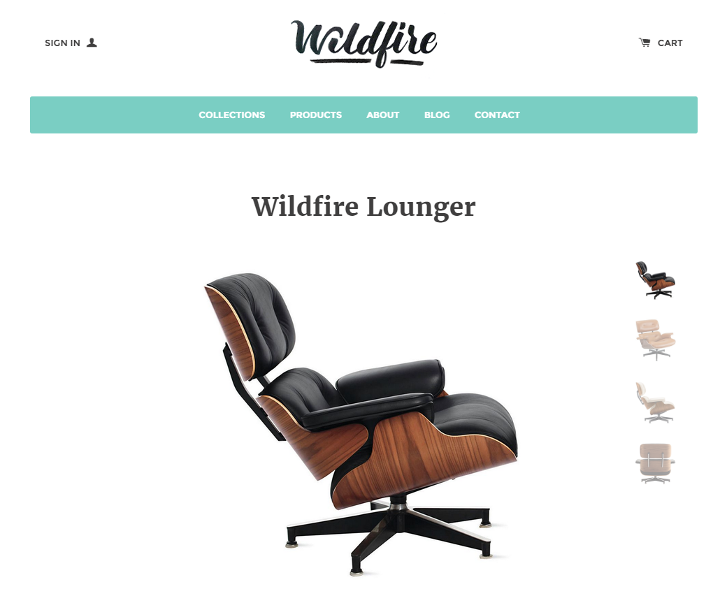 Last but not least, the final entry on our list is one of most premium themes available for e-commerce websites. Launch does a lot of things but compromising on functionality or quality is not one of them. It is top-notch in both looks and operation and can be molded to complement your brand perfectly. With 3 built-in presets – Bold, Fresh, and Cool, Launch is ready to go soon as you purchase it. The theme provides a rich set of features that include Goal Tracking, Accepting Pre-Orders, and Testimonials Carousel to let your customers speak for your products or service. Custom About and FAQ page. Customizable header, navigation, and product pages. Includes technical specifications option for your products. 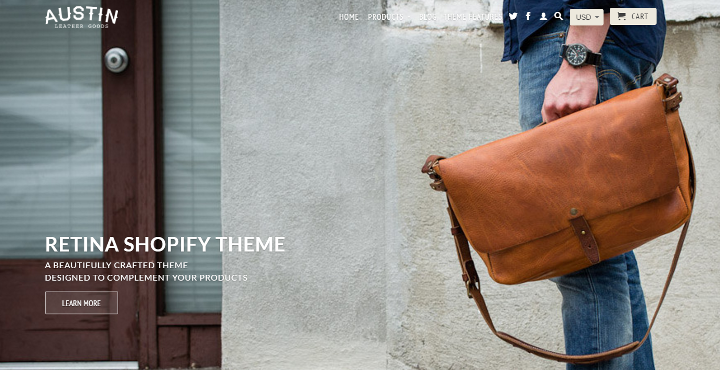 So this rounds up our list of the best Shopify themes available in the market. We opted for a balanced list of free, low, and high priced themes because we can appreciate that every business has different needs according to their nature and scale at which they operate. We hope that you will be able to find what suits you best on this list. Did you find your perfect match theme on this list? Is there a Shopify theme that is your current favorite? We’d love to hear your take on it so let us know in the comments below!